More than 300 people with extra seating brought in. Over 300 people packed the Melvin Hall on Monday 20th August to hear representatives of NHS Grampian give information on the closure of Tarves doctors Surgery due for September 7th. Doctors, Fiona Munro and Roy Burnett from Haddo Medical Group were also on hand to explain the reasons the practice were taking the decision. The meeting was a series of questions from the audience to the NHS and Haddo Group practice following an initial briefing. Local MP Malcolm Bruce attended but Local MSP Alex Salmond was absent. Mark Macdonald , a government MSP for the North East did attend. Local Councillors Paul Johnston and Cryle Shand but apologies were received from Cllr Hendry and there was also a notable absence from Council leader and local Councillor Jim Gifford. All three Community Councils that cover the Haddo Group practice area had asked NHS Grampian for the meeting and made specific points at the meeting about the situation. Almost immediately on the conclusion on the briefing, the previous decision to allow a pharmacy in Tarves was severely criticised. Several speakers pointed out that the consequence of allowing the NHS subsided pharmacy was the withdrawal of dispensing at Haddo surgeries for the bulk of patients. This led directly to the predicted squeeze on the Haddo Medical Practice finances and their being forced to close the Tarves surgery to balance their books. The meeting heard from Tarves Community Council who challenged the NHS representatives that they had, as a board, the powers to reverse the dispensing decision. Dr Munro from The Haddo Medical Group indicated that the surgery could only possibly stay open if the dispensing issue was resolved. The NHS present were unaware of their legal powers at this point. Pam Gowans of the NHS was unable as well to deny that the net cost to NHS Grampian of dispensing via Tarves Pharmacy, along with Community Pharmacy subsidies and fees would exceed the costs of the pre-existing dispensing costs to Haddo Medical group. Cllr Paul Johnston asserted that the decision should be viewed as perverse given that the decision to open the Pharmacy was costing people more for providing less medical service. On that basis, all the Community Councils felt there were reasons why NHS Grampian had to go back and review the situation. Local MP Malcolm Bruce told the meeting that attempts to get the issues raised with NHS Grampian had not proved successful and that it was a Scottish Government ministerial decision ultimately through its pharmacy arrangements, . However, Mark Macdonald, a government (SNP) MSP who attended the meeting said he would write to the minister and try to prevent the situation happening elsewhere. This brought a strong audience reaction. Mr Macdonald, then later said he would ask Alex Salmond’s office to assist and also try and see what action could be taken to review the current closure. Members of the audience challenged the NHS to indicate why they were ignoring patient care because they believed ‘rules’ stated they had to. Similarly, it was said that the NHS got themselves into the mess on having to withdraw dispensing at Haddo Surgery in Tarves and Pitmedden and therefore they should maintain service by a direct subsidy to compensate. Pam Gowans of the NHS said that NHS budgets were stretched and this in turn invited criticism from the audience that the motivation appeared less about maintaining health care but simply minimising expenditure. 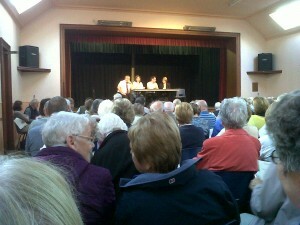 Haddo Medical Doctors were also challenged by residents as to what more could be done to maintain services. They indicated that they were not allowed to continued to dispense without a license and the costs of maintaining the surgery were very much larger than just the doctors and receptionist cost. It was not viable for them, said Dr Munro. Chris York from Tarves, asked Dr Burnett if the decision by the practice to dispose and sell the building could be delayed until such times as the future of dispensing might be reviewed if the politicians in Government agreed. Dr Burnett indicated that the practice regretted being in this position and outlined the long history of trying to prevent the closure. The practice, he said would do all it could to avoid taking pre-emptive decisions to dispose if there was a chance, but at some point, they would be forced to consider its future. The views from the audience were that there were little alternative for another surgery venue if the building was sold for another use. There were several persistent calls for a boycott of the new pharmacy. The NHS, doctors and members of the audience with medical and government knowledge confirmed that it is up to the individual patient if they wished to use their prescription at another pharmacy such as Oldmeldrum or Ellon. The practice at its Pitmedden surgery have and will make arrangements for the medicines to be delivered from any of the local pharmacies and had those in place for Oldmeldrum. Several people indicated they would wish to not frequent the Tarves pharmacy. Local residents Dr Helen Stephen and Dr Helen Milne, spoke strongly about the need for people to make up their own mind. Should the Pharmacy in Tarves not prove viable for their owners, which includes Mr Semple, then the issue of dispensing would again be reviewed. A number of people indicated a their own personal boycott was likely. The NHS asked local MP Malcolm Bruce, Independent Councillor Paul Johnston, and MSP Mark Macdonald of the SNP to indicate their summary of the meeting. Mr Bruce indicated he would continue to press the Scottish Government to review the NHS dispensing issue and ask them to look at overturning the pharmacy decision which led to the closure proposal. Mr Bruce urged each resident to individually write to the health Minister or Alex Salmond. Councillor Johnston thanked the local Community Councils for all their campaigning against and said people did not blame local doctors for being forced into this position by the pharmacy decision. Cllr Johnston said the he would work with Community Councils to try find a legal challenge if it were possible. It was however, a government decision and he indicated that NHS Grampian had perhaps followed the rules to the letter – however, he said “If the rule was daft then you get a daft decision even though the NHS are doing the correct procedure” Cllr Johnston asked the MSP Mark MacDonald to go back to Alex Salmond and health Minister Sturgeon to express the strong local opinion and get them to overturn the “daft decision” He said the NHS still had many questions to answer and also made an a specific request that was backed by the audience for the local Community to be given the opportunity of Addressing the NHS Grampian Board directly. Mark Macdonald MSP said he understood local feeling and appreciated the problems. He said he would write to the minister, Nicola Sturgeon in Edinburgh and contact local MSP Alex Salmond who was absent. The NHS Grampian officials thanked the audience and indicated they would respond to specific local questions via the Community Councils. It is sad that Haddo Medical Group have taken the decision to close the surgery in Tarves, and it was clear from the meeting that the decision is final. In trying to find a positive element in all of this, would it not be possible to find an alternative space, somewhere else in the village, where perhaps an independent GP could provide surgery sessions? Perhaps a ‘mobile’ GP could service the needs of Tarves – in much the same way as the mobile bank, library and fish van that visits the village. This might provide a solution for those who do not have access to a car, or for those who are concerned about the bus service to Pitmedden. Before you start sending letters to Alex Salmond perhaps you should read this report and consider the previous suggestions posted. We should be using this board as a forum to discuss not only the closure but also how to move forward and start to think outside of the box. The surgery will close, we should not waste our energies trying to reverse a decision already taken and forgotten about by our politican, but explore the possibility of approaching NHS Grampian about siting a “new” GP in the village.